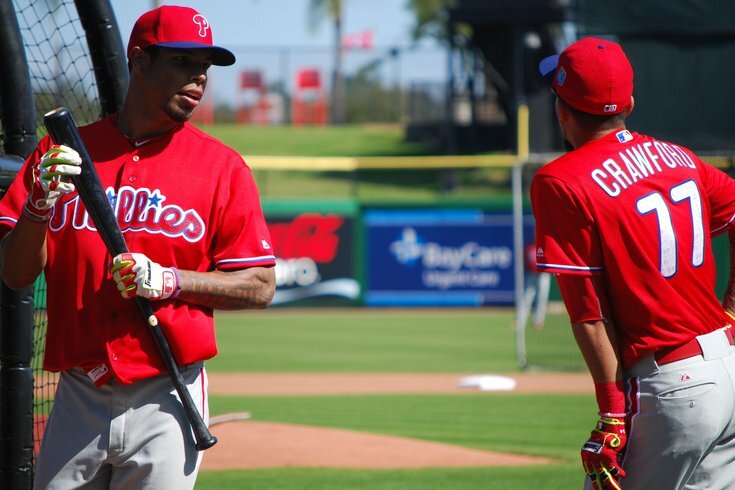 Nick Williams, chatting with fellow top prospect J.P. Crawford in spring training in Clearwater, Fla., is a favorite to join the Phillies roster next month, if not next week, when major league rosters expand on Sept. 1. It’s been exactly one month since Phillies outfield prospect Nick Williams returned to the lineup of the Triple-A Lehigh Valley IronPigs following his second benching in two weeks. Williams was reprimanded for disciplinary reasons: not running out pop-ups and ground balls on separate occasions (and throwing his helmet after one of those incidents). Although IronPigs manager Dave Brundage hasn’t had any issues with Williams in the last month, his star outfielder has developed a reputation since his forgettable June. The incidents are more than a month old, but it didn’t stop philly.com from keeping the story going just last week (with a very strong headline, no less). The benchings were also accounted for in a small blurb in the latest edition of Baseball America, a publication that can be found in any clubhouse in both the major and minor leagues. So it was only fair to ask Brundage this week if all is well with Williams. “Nick Williams is a good person,” Brundage said inside the manager’s office at Coca-Cola Park on Monday. “He’s a good young man that really wants to play the game of baseball and I hit him where it counted (in benching him.) That’s what we do with our kids. You know, when we discipline our children it doesn’t mean we don’t love them. The same thing carries over. “You’re either going to learn or you’re not. And you’re going to learn the right way. And that’s what we preach as an organization. You’re going to learn the right way and you better do it right here … because you can times it by 10 (in the big leagues). Although his plate discipline doesn’t ever expect to be a strong suit - Williams has 90 strikeouts and 18 walks in 395 plate appearances this season - there is no denying Williams physical talent otherwise. He entered Friday hitting .287 with 10 home runs, 27 doubles, and a .789 OPS in 93 games with the IronPigs. But minor league development doesn’t end with an offensive slash line, either. If the Phillies were a contending team, there might be a better reason to push a prospect like Williams (who turns 23 in September) to the big leagues. The Phillies are not that team. So if you can continue to develop him in Allentown, why not? “I know we all make mistakes,” Brundage said. “We make them once, twice, sometimes three times. We all have in our younger years. That’s what I say, bad habits are tough to break. I think along the way, he’s gotten away with that. And it’s something that Philadelphia and our organization does not approve of. And you know what, we’re going to play the game right, and I want everybody on board. You’re not doing it for me, you’re doing it for your teammates and it’s something that I preach. “It’s not (who he is). He just didn’t run a couple of balls hard out. If that’s the worst thing you ever do in this game, I think he’ll be alright. I mean, Jimmy Rollins was still doing it [laughs] at certain times. I mean, Nick gets it. He understands. He wants to please. He does, he wants to please and he wants to please his teammates, he wants to please his family, and he wants to please us. If you take a look at the latest midseason prospect rankings at both Baseball America and MLBPipeline.com, the latter of which lists the top 30 within each organization, you will not find Andrew Pullin’s name. This despite his claim as the co-home run champ (with 14 in 123 games) of the Florida State League a year ago. But that’s just fine with Pullin, probably. Plenty of athletes use slights as motivation. But Pullin has been putting up numbers this season long before those rankings were released. The Washington state native and former fifth-round pick (2012) entered Friday hitting .319 with an .874 OPS in 57 games between Double-A Reading and Class-A Clearwater this season. Pullin, who turns 23 in September, has really taken off since his promotion to Reading on June 23: he homered in five of his first 16 games in Double-A and came into Friday hitting .365/.427/.576 in his first 21 games in the Eastern League. “I’ve just been trying to keep it simple and try not to do too much, looking for pitches I want to hit and execute that,” said Pullin, a left-handed hitting outfielder who spent the 2014 season playing second base. Pullin got off to a slow start in 2016, but not for the usual reasons, like cold weather in the northeast. He retired in early April. Reading, which has scored 600 runs in 105 games this season (120 more runs than any other team in the Eastern League), is probably happy to have him, too. • Roman Quinn should be back in that formidable Reading lineup within the next week. Quinn, 23, was sidelined for six weeks after suffering an oblique injury in mid-June. But he began a minor league rehab assignment this week in the Gulf Coast League, going 4-for-10 with two stolen bases in his first three games. The 23-year-old Quinn, one of six outfielders on the Phillies' 40-man roster, could push for a September call-up if he continues to hit in August as he did in the season’s first two months (.288/.361/.420 in 50 games) but his biggest challenge continues to be staying healthy. Since being selected in the second round of the 2011 draft, Quinn has failed to play in more than 88 game sin any season (and has played 67 games or fewer in three of his first four full professional seasons). But, he did see snow for the first time in his life this season. • Unheralded right-hander Sixto Sanchez is a big reason the Gulf Coast League Phillies (21-10) have the second-best record in the 17-team league after roughly a month of play. Sanchez celebrated his 18th birthday on Friday by extending his scoreless innings streak to 21 by delivering six shutout frames against the GCL Blue Jays in Clearwater. Sanchez has struck out 14 and walked four in those 21 innings, over a five-game span. General manager Matt Klentak volunteered Sanchez’s name as one of the pleasant surprises on a somewhat star-studded roster in the GCL (first overall pick Mickey Moniak and $4 million Dominican Jhailyn Ortiz are among those on the roster. Sanchez, listed at 5-10 and 160 pounds, was not among the high-profile names to sign out of the Dominican. He has a long way to go, obviously, but if Sanchez makes it to the big leagues he would be just the second “Sixto” to ever play in Major League Baseball, joining Sixto Lezcano, the former Phillie who hit a home run in the decisive game of the 1983 NLCS against the Los Angeles Dodgers … and was clearly one of the best names for Hall of Fame broadcaster Harry Kalas to say aloud. • Left-handers Ranger Suarez and Denny Martinez also had fairly successful weeks in their respective leagues: both threw seven no-hit innings on Tuesday. Suarez, a 20-year-old Venezuelan, pitched a seven-inning, complete game no-hitter when he struck out five of the 20 batters he faced and walked just one in the first game of a doubleheader against the Auburn Doubledays at short-season Williamsport. On the same afternoon in the Dominican Summer League, the 19-year-old Martinez (also Venezuelan) didn’t allow a baserunner in seven innings. Martinez struck out eight of the 21 batters he faced but was replaced with Victor Sobil (who earned the save) for the game’s final two innings. • Adonis Medina, Suarez’s rotation mate in Williamsport, nearly had a no-hitter of his own a month ago: he lost it with one out in the ninth at Auburn on June 27. Medina, rated the 8th-best prospect in the Phillies system by Baseball America, took a 4-0 record with a 1.14 ERA after seven games into his start on Friday night against the State College Spikes. Medina has allowed just 19 hits in 39 1/3 innings at Williamsport; his 0.763 WHIP is the best in the New York-Penn League among pitchers with at least six starts. (Note: this video is from a year ago when Medina was in the GCL).